Ratepayers constitute a small minority of the people affected by the decisions of the Adelaide City Council – and the rest of us deserve a vote, argues Bension Siebert. Having spent almost every Tuesday evening over the past four years reporting on the deliberations of the Adelaide City Council, it strikes me that there’s an always elephant in the room. It’s the fact that despite countless rhetorical appeals to the interests of ratepayers, this group – limited to residents and business owners in the CBD and North Adelaide – rarely has the exclusive, or even the major stake, in the public policy questions being decided by the council. The Adelaide City Council spends the vast majority of its time making decisions in which visitors to the city – 228,000 of them every day, including 118,000 workers – have an important and worthy stake. It’s strange, then, that only 23,000 residents and the owners of about 15,500 businesses in the city and North Adelaide have the right to elect the city’s governing body. Even those who rarely visit the city and live far beyond the council’s patch care deeply about its decisions, because the Adelaide City Council is a battlefront in the larger war over the present and future identity of Adelaide, and that of South Australia. Case in point: the most vicious and hard-fought public debate during this term of council has concerned a few-hundred metres of bikeway on a single street in the CBD. 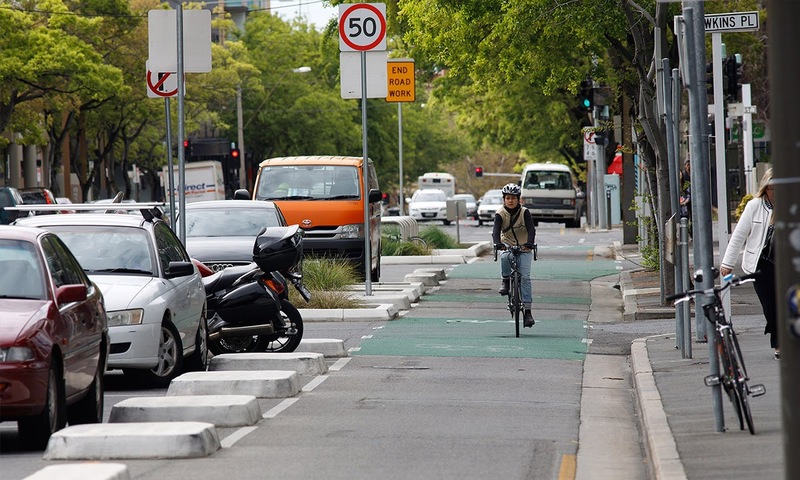 Clearly, the public spat over the Frome Street Bikeway was not merely the concern of a small number of nearby businesses and households, but constituted a larger and more universal conflict. NIMBYism is particularly galling when the very wealthy dominate debate about the very poor. The debate has had little to do with the merits of that minor piece of infrastructure and everything to do with certain conservative and progressive ideological loyalties that colour how people feel about transport in this, the most car-dependent Australian state. South Australian taxpayers funded 50 per cent of Frome Street’s multi-million dollar political solution. Another taxpayer-funded political fix for ratepayers – the public purchase of the former Le Cornu site in North Adelaide, overpriced as it may have been – was partially justified by the fact that South Australians writ-large, even those who have never been to O’Connell Street, felt the embarrassment of that decades-vacant high street plot. That nothing ever happened there, despite plan after plan, promise after promise, played into the meta-narrative about South Australia that also includes the old one-way Southern Expressway, the Holden closure and the nuclear fuel cycle inquiry’s failure to launch. Giving all South Australians a vote in the Adelaide City Council would be impractical and implausible, but giving city workers the vote would go some way to acknowledging the breadth and the impact of the city council’s politics and its capital city decision-making. Frequently, the Adelaide City Council becomes a forum where obviously interested stakeholders have little say. When a businessperson seeks to put on a “vibrant” event on public space, other businesspeople not fond of competition and city residents not fond of loud noises enter the formal debate, but consumers (read: workers) rarely do. Anyone can make a five-minute public statement to Adelaide City councillors, but this is far from enough. Enfranchising more people – on a voluntary basis – would not only give them a say in the decisions that affect them but fix some of the structural weaknesses that prevent the Adelaide City Council making rational decisions about others. The original Frome Street bikeway: the debate was about much more than a single street in the city. All councils struggle to respond well to those who suffer poverty visibly, in the public space. Councillors often fall short of humanitarian impulses when the political imperative is to move the problem elsewhere, rather than deal with it. When only those with a financial stake in nearby property are empowered to elect a level of government making decisions on behalf of those who will never have such capital, the consequences are foreseeable. Vulnerable people, displaced so that services that would help them cannot. This is the outcome when capital dominates the politics of the city council. People who work in the city – many of whom spend most of their waking hours there – should have a right to vote for councillors who shape its future. And not only for their own sake. Bension Siebert reports on the city council for InDaily.